The discussion on TWF forum is quite intense now which simply shows that many people are really interested in keeping Warhammer as we know it going. Personally, I am very happy to see such independent initiative and I even understand the fact a lot of people see it as an opportunity for wish listing. I hope, however, that the work on 9th Age will go towards making Warhammer a better game. That is, of course, quite vague description but the reason for that is that I am not sure yet which direction people who work on it want to go. I decided that the best way I can help them is to play the games with their rules pack and then write reports as a source of feedback. Real games are, in my opinion, absolutely necessary to develop the best version of the game. 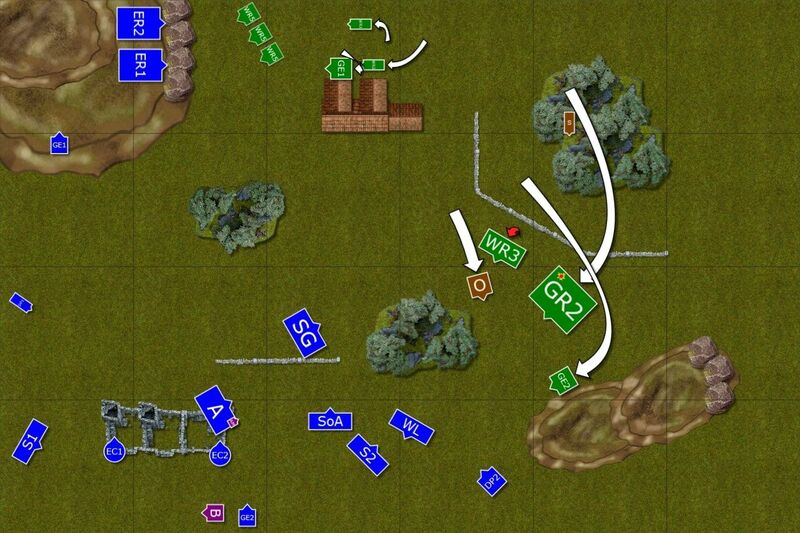 - Spears: they now give KB against cavalry/monstrous cav. when engaged to the front; a good change and pretty representative of what spears did in classical warfare. - Magic System: Miscast table reworked, the results vary based on how many dice were used to cast. Irresistible force now adds a big bonus to the casting roll, but can still be dispelled. Maximum casting dice = 5. - Fast cavalry: units were split in pure fast cavalry that can vanguard (such as Reavers, Pistoliers, Spider Riders and the such) and Light Troops that retain the old fast cavalry rules in terms of movement/reforms but not the feigned flight or the vanguard option (such as Wild Riders, Warlocks, Pegasus Knights). 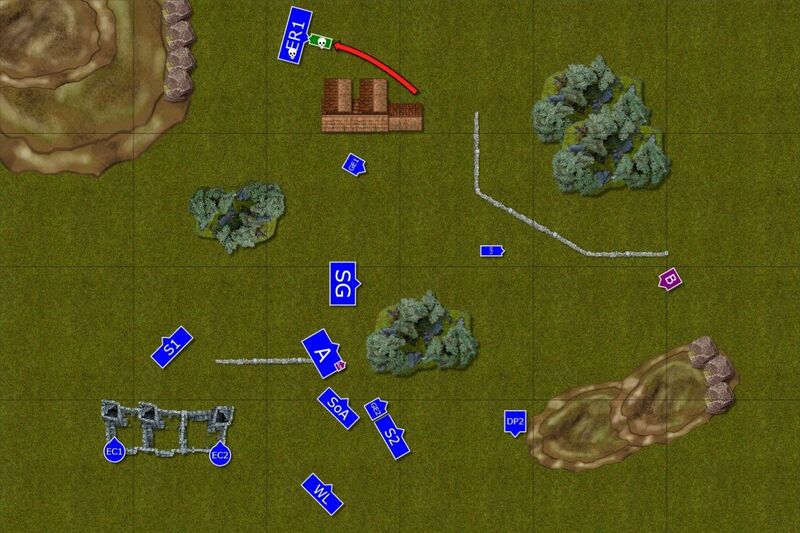 - Parry save: this was upped to 5+ in an effort to increase the use and survivability of Sword and Board infantry; a good change, if you ask me, and another reason to try and flank these infantry blocks! Other notable changes are slight points tweaks and nerfing of the worst offenders (Banner of The World Dragon, Chalice of Darkness, Storm Banner and the such) and a brand new Army Book for Beastmen! Personally, I was surprised to see Lores of Magic reworked and different Miscast Table but maybe I should not be as often people complained about magic being too powerful. The changes to Parry, Spears and Killing Blow are very interesting and look very good on paper to me. I am not sure what to think about Fast Cavalry/Light troops but I presume the proliferation of DE/WE avoidance armies had something to do with it. Marks of Chaos are probably a good change for non-WoC players but then it is supposed to be the version that makes the game better for everybody, not another chapter of arms race. "They sent who?" - asked Larry in a steady voice, looking at the reporting scout, who was sitting by the table full of maps and letters together with Bob. While the voice and face were under the perfect control all who knew the Loremaster well immediately noticed that it was the sign of the well contained anger. "Wild Hunt. We managed to outrun them only because they let us. Asrai wanted us to know they are coming." - replied tired soldier, taking another sip from his goblet. "We haven't fought against our savage cousins for ages. And now they send Orion himself. Such an honor." - added battle standard bearer chuckling ironically. "That is not coincidence we keep fight more of our own these days." - stated Larry - "And it is not an accident we face Wild Hunt this time". "I wonder who convinced Orion to hunt us down." - Bob studied the maps wondering how long did it take King in the Wood to travel so far away from Athel Loren. "Oh, I am sure you know the answer to that question already" - laughed Larry bitterly. "Indeed, I do" - said veteran warrior clenching his fists. - "Time to march again. Time to show the Hunter he can be a pray sometimes too." A very fast army with units that can hit extremely hard (Orion and Wild Riders), is much more maneuverable and can shoot too. My griffon would not like these poisonous arrows at all. In 9th Age, Glade Riders can start the game as normal and vanguard as any fast cavalry or be kept in Ambush as previously. 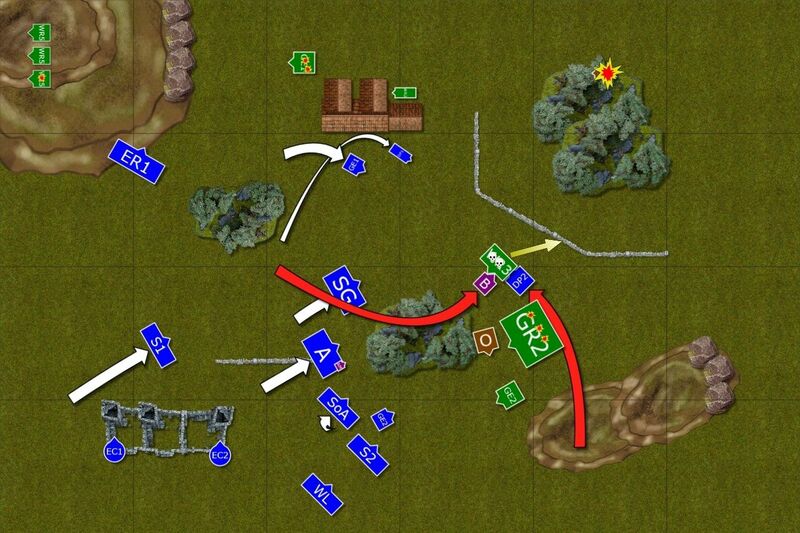 Wild Riders lost their vanguard but are still fast cavalry for the purpose of movement. With Orion having movement 9 and so many vanguarding units (Warhawks can do that too) I expected to be hard pressed turn 1. I really like the look of this force and I can easily imagine how great it would look on the table. I decided to bring my Outcasts with only a slight change. As you can see I took Sea Guard again! I wanted to see what they can do with their new Killing Blow rule against so many cavalry units. In order to make room for them I had to downgrade reavers champions to regular warriors. Bolt Throwers are also 10 points more expensive so Sisters are now 8 strong instead of 9. I wanted to use my shooters to thin down the enemy before they can be upon me. 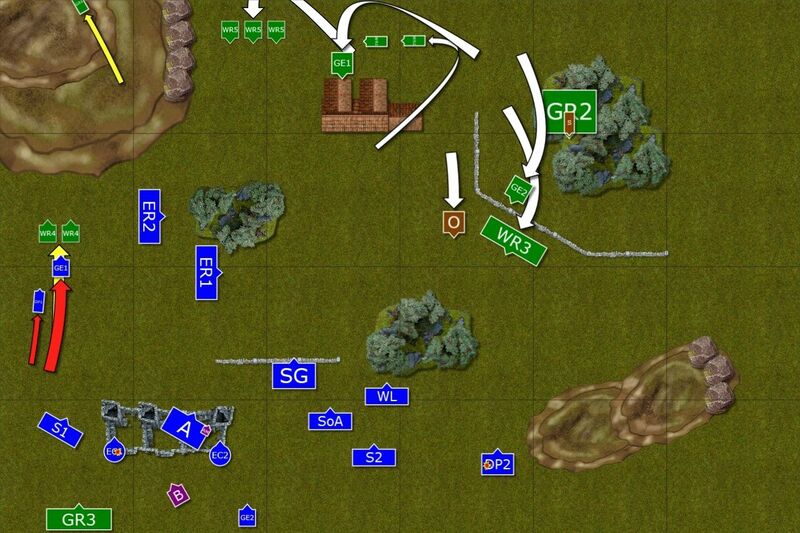 But I also decided to go for aggressive defense, meaning I would start in defensive formation with my own cavalry ready to counter turn 1 too if any unit would be close enough for a charge. 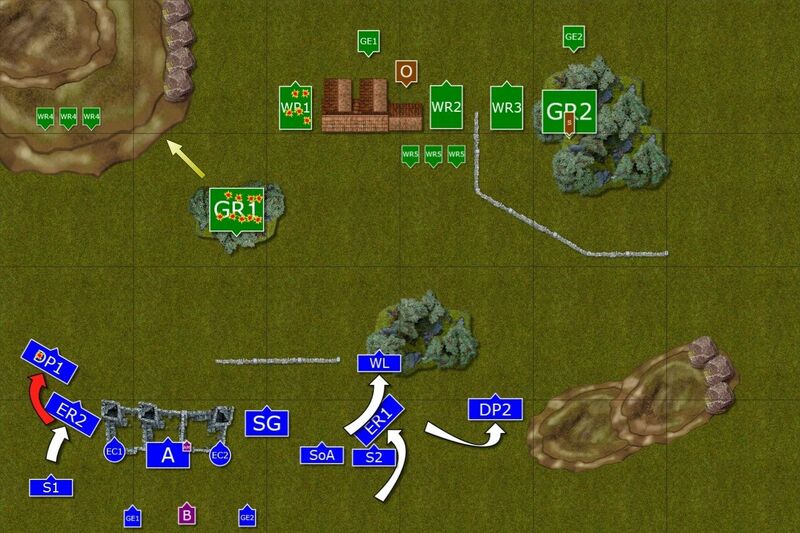 Another important thing to remember was to advance in double line formation to avoid situation where warhawks land behind my line. I think I also have a good chance to harm WE in close combat but I will need to chose the fights right. 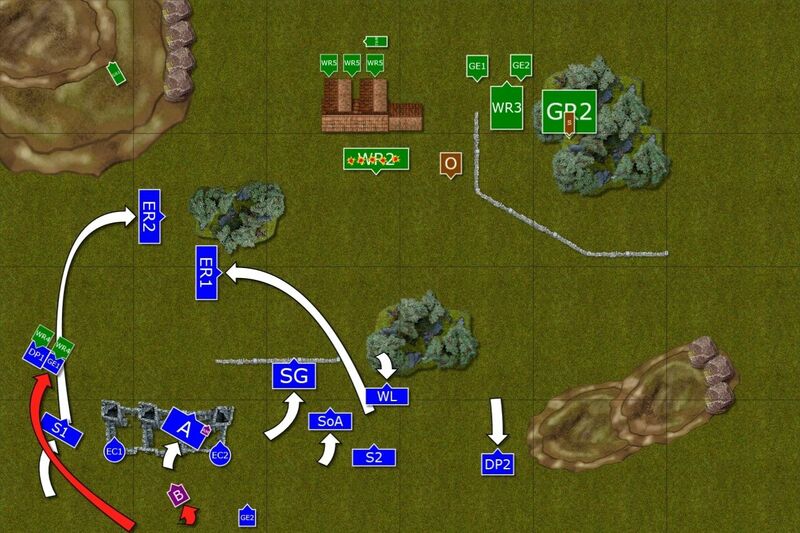 With SM/WL hitting after ASF cavalry these elite infantry is really at the back foot and can be aggressive only if flank attacks are possible. However, with the help of magic I can actually affect such combats significantly, denying the re-rolls with Miasma (lower the initiative) and making it even harder to hit with Iceshard. There is no mysterious terrain in 9th Age. We treated the rocks on the edges of the hills as dangerous terrain. Elithmar won the roll off to choose the side and took North. He also won the roll to start deploying. No other vanguards. One regiment of Glade Riders was kept in the ambush. I wondered how to use terrain to my best advantage. Elithmar won the roll off so I had to use what I got, i.e. South deployment zone. 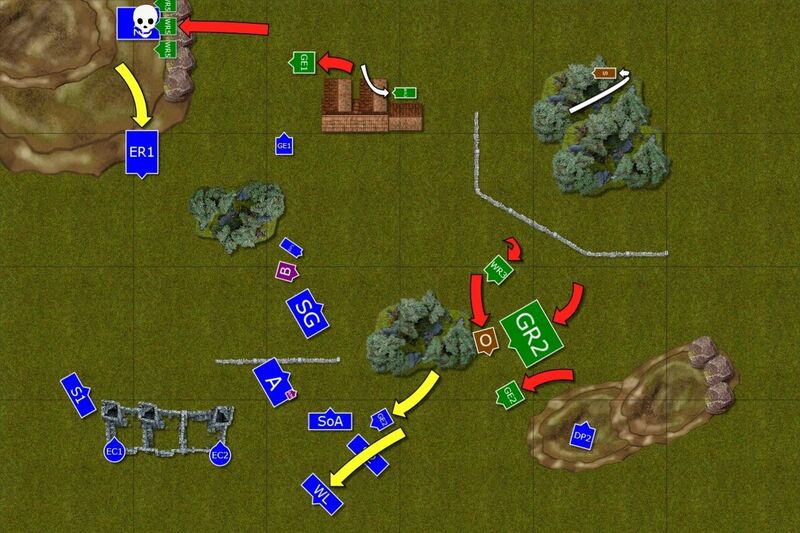 The battlefield was rich with terrain so no matter which side I would be it offered something to use. First thing I noticed as useful were the ruins. 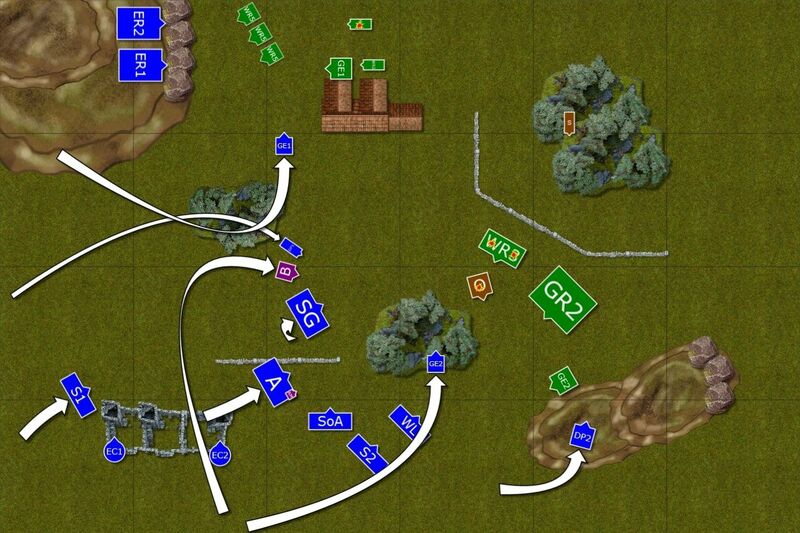 With cover and DT for charging units (and 1-2 counting as fail against cavalry) it was a perfect defensive position for the shooters. I pondered about the hill but I decided ruins are better, also because Elithmar got Master of Stone spell (will talk about it later). I knew I had to have good, solid formation to start with. Double line formation to prevent landing zones. But I also didn't want to castle and choke myself in the corner. 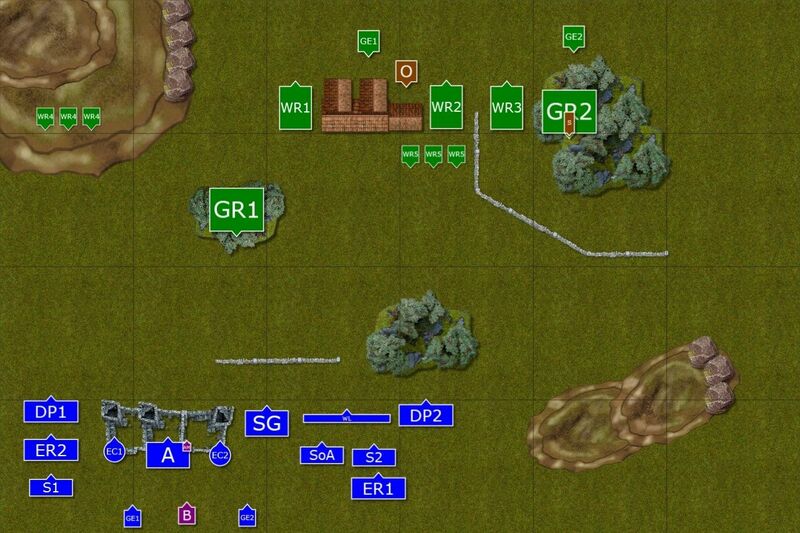 Hence, I chose to deploy in tighter formation first but with heavy cavalry on the flanks to spear head the counter and with the plan to move elite units forward (as well as Sea Guard) to intercept the advancing enemy and don't allow outflanking. I thought that attack is the best form of defense especially if I could help my shooters to continue doing their job. I also kept light cavalry and eagles behind because they are the most fragile but may become more important in the later turns of the game where speed matters more for various reasons. 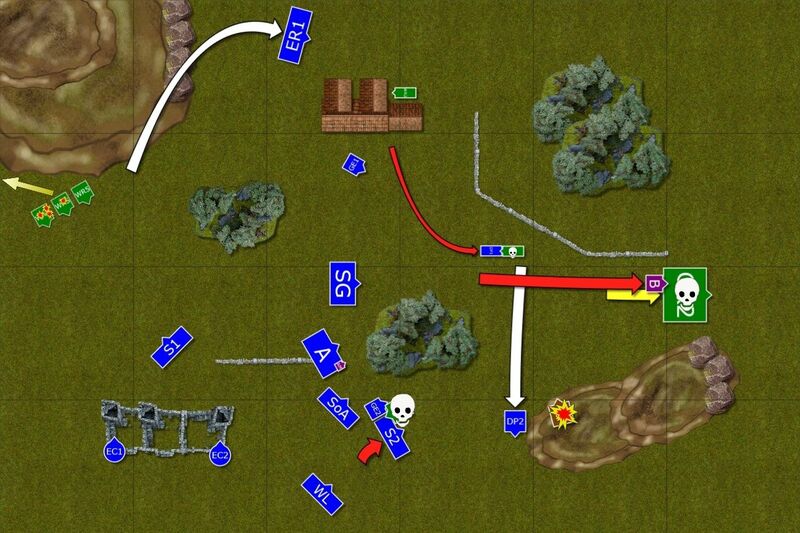 Either defensively, to still have units to block the enemy or have fast shooters to go and hunt down the survivors. I got lucky though and won the roll off to have the first turn! 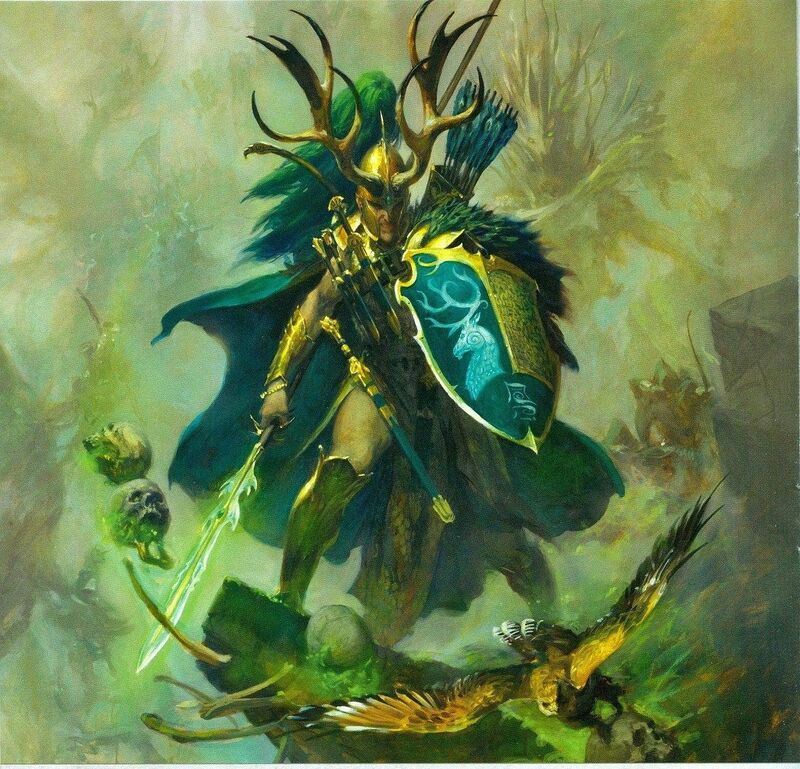 Wood Elves taste their own medicine - shooting! Outcasts seized the initiative despite the fact the enemy was faster and more maneuverable than them. Centuries of the constant campaigning allowed for smooth deployment from the marching formation. Orion seemed amused that his adversaries offered such a challenge to his Wild Hunt. Dragon Princes on the left flank risked a long charge against vanguarding Glade Riders but overestimated the distance. Larry the Loremaster tried to weave some fireballs from the very weak winds of magic but he failed. It was up to the shooters to do some damage. Archers, Reavers, Sea Guard and Sisters all focused on the Glade Riders lurking in the forest. Despite additional cover High Elves showed their savage cousins it was them who invented archery. Only a single survivor was left alive and he fled to safety. Eagle Claw crews didn't want to be worse and aimed at the Wild Riders and again, a single rider was left standing. Orion didn't give the order to all out attack yet but Warhawks decided to intercept Dragon Princes regardless. In the flurry of movement two High Elf knights fell down but not before one Warhawk rider was killed too. The fight was not resolved yet though. Other elements re-positioned and Orion used his massive bow to kill two more knights from the second Claw of Dragon Princes. Their grim companions refused to abandon their positions though. Great eagle swooped down to help Dragon Princes but it was not enough to tip the balance into the favor of High Elves and the fight continued. If only Bob was more eager to come and help! The rest of the army moved forward a bit to get into the shooting range and another group of Wild Riders was reduced to a single member. Only Lions and Dragon Princes moved back to draw remaining enemy troops in. With yet another unit almost destroyed Wood Elves had few regiments left. These didn't move forward that much either, Asrai being more content with some shooting attacks and withdrawing the survivors to the safety of a nearby abandoned village. One squadron of Glade Riders sneaked behind Outcasts' lines and was threatening to overrun the bolt throwers. However, before that happened eagle claws opened fire and ambushers quickly decided it is a lost cause and fled the battle as quickly as they appeared. 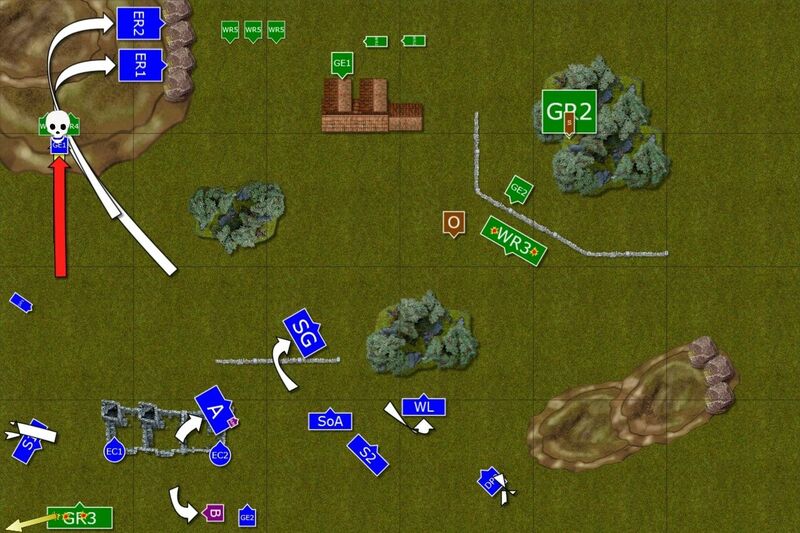 Reavers maneuvered to the hill to have a good line of sight to surviving Wild Riders but could not land a proper hot yet. Other units re-positioned expecting the charge of Wild Hunt soon. Wood Elves don't give up! Wild Riders charged Lions. 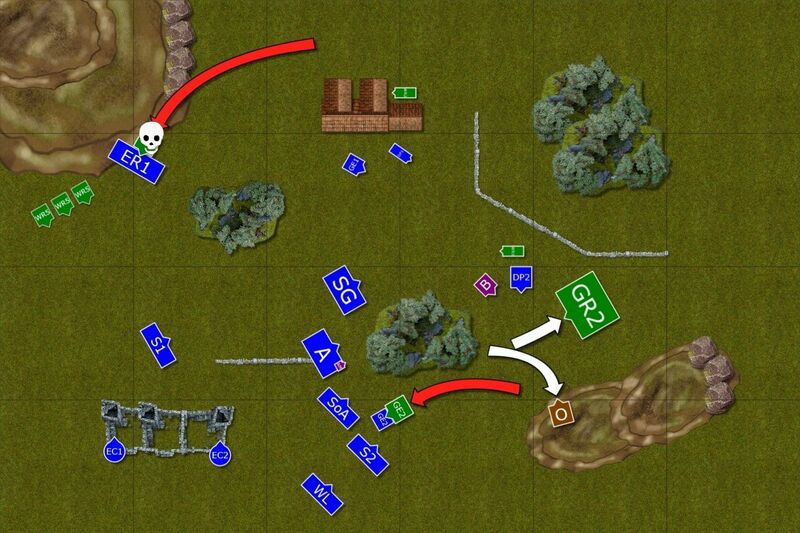 Warriors of Chrace were now cowards but they knew very well what chances they get against Asrai cavalry and executed tactical withdraw to get the enemy closer and counter charge. Wild Riders are reckless but not stupid and slowed down expecting a trap. Ellyrian Reavers ignored the threatening maneuvers of the nearby Warhawk riders and tried to hunt down surviving riders. This time they succeeded in getting one but the second rider escaped his destiny for a while. Rest of the army pushed towards the center of the battle field in anticipation of some bold moves from the remaining forces of Wood Elves. Wood Elves were losing the ranged attacks duel and they decided to wing the balance in close combat. Unfortunately, only Ellyrian Reavers held and met Warhawk riders head on. The rest of the High Elf units withdrew. In the resulting chaos Wood Elves lost their cohesion and units bumped into each other instead of catching retreating enemy. Only Warhawks succeeded in breaking the enemy. Taking advantage of the situation and the confusion among Wood Elves, Outcasts charge in. Bob the BSB and Dragon Princes coordinate their long charges perfectly and managed to get two wild riders without suffering any casualties in return. They ignored lone survivor and reformed to face fresh enemies. The shooters do what they have done so well so far but it was Larry the Loremaster who dealt the most painful blow when he used his magical sight to seek out his adversary and destroy him despite the protection of the forest. Surprisingly, single wild rider rallied and prepared to fight till the end (Edit: Elithmar got double 1 for the rally test!). Great eagles swooped down against the enemies but failed to succeed in their mission. Orion and Glade Riders moved to new positions but would they have time to mount the last attack? High Elves pushed one more time to deal the killing blow to their enemies. Dragon Prince leveled his lance and charge wild rider who bravely took the charge but died in that knightly duel. Glade Riders decided to perform feigned flight but griffon was too swift for them to escape and they were run down. Warhawk riders lost a few of their own and the survivors decided it is not worthy pressing forward and withdrew. Finally, all remaining shooters aimed at Orion, King on the Hill. He stood proudly, motionless and didn't flinch when the arrows started hitting his body. Last Wild Rider charge exposed reavers, dodged arrows shot at him and attacked the enemy. One of the reavers fell from the horse but his companions avenged him and got brave Asrai warrior. With no enemies left on the battle field Outcasts were clearly victorious. "They were all ghosts!" said Larry without even trying to hide his relief. "Indeed, they were." confirmed Bob, as always stoic. "What does it all mean though?" asked another warrior. "That those who sent them simply wanted to test us again"
First of all I would like to thank Elithmar for the game. He had a tough time in his first battle with Wood Elves but took all the blows with great spirit. I am really grateful for that! I also wanted to thank him for adding comments to the turns as I know it is not easy to recall a defeat with such details. I do hope, however, that the report will be helpful to him and that his future games with WE will be victorious! I certainly didn't expect such an outcome. I knew I am against a fast army with many great assets so I am happy my plan worked. Elithmar made some mistakes that I think had important impact on the end result. First of all vanguarding forward, even into the forest, may not be good idea. It didn't lose him the game but losing entire unit like that without having a chance to fight back didn't help. 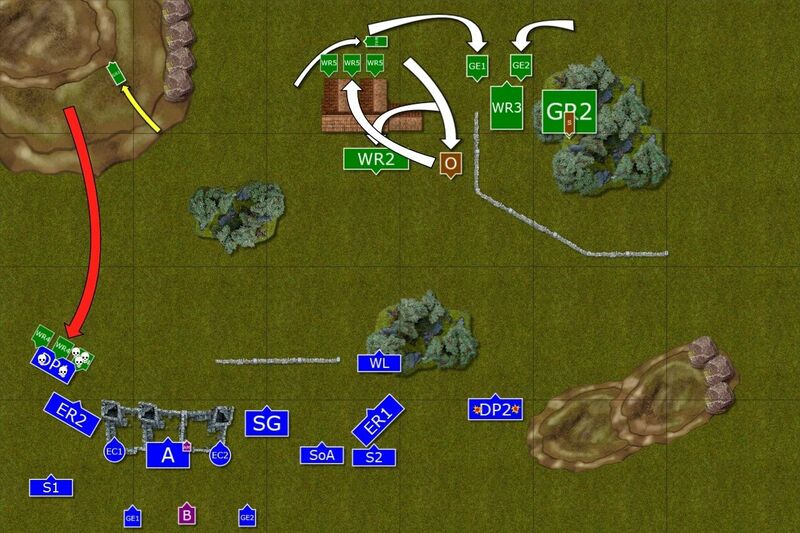 But the main thing that helped me execute my plan was being shy and not advancing fast to be in a position to attack turn 2. He had an advantage in close combat but didn't use it and when we finally had fights they were not on his terms. 1. Army List - I took LSG back because they have KB. That in itself was a good incentive to have them back on board. I didn't have a chance to use them in close combat but they have a nice purpose now. 2. Magic - we failed to remember that you can keep casting after losing the concentration. It might have had additional impact on the game. Changes to the lores and spells are interesting but can't say yet if I like them as I haven't used the spells in new way. I like bubble Earthblood on paper for example or increasing armor save as a new Metal attribute. But these things will be apparent in the longer run. Other than that we didn't encounter situations where new rules would have had some impact. 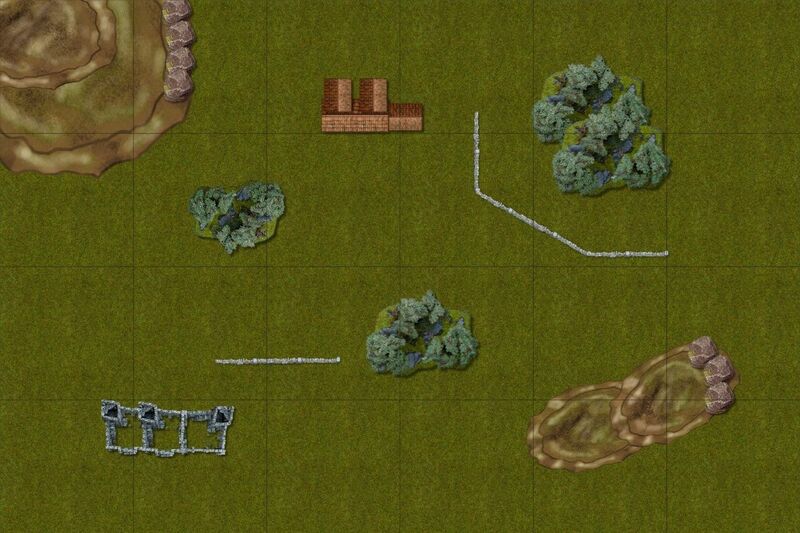 I do like the line of sight and terrain rules though so I might have omitted that as too obvious. I guess the changes can also be more evident if one wanted to play a game to test as many things as possible on purpose. Be it by choosing many units that were reworked or looking for the situatons where the changes occurred. I hope you enjoyed the report and thanks for reading! Hi SM, Eli's first game with Asrai? I've faced him a few times with his Woodelves, maybe it was his first game with the last book. I still love my Sea Guard, and wow they got better? That's awesome. I'm going to have to have a look at this 9th Age thing. I like Eli's list, but not sure how it wins games. I've had that wood elf book since release, and I've really struggled to come up with a list I like, I loved the old book. Hello mate! Good to hear from you! I have high hopes for 9th Age initiative. Some people are worried about not official support but it seems a lot of people embarked on that journey and things are picking up the speed. It is definitely worth checking and they are getting ready to release Beta version soon. It will be very interesting to see what they cooked for us. Check out their website my friend! You should definitely read it, just to see if you like it. Have you looked at Furions' reworked 8th ed? Definitely worth looking into it, I prefer it over 9th age so far. Thanks a lot! I am glad you like the reports! I have literally just finished another game with 9th Age and will do my best to prepare the report. As a spoiler it is against DE and it is very much like any civil war you read about in the background stories! I am afraid that due to personal reasons I am not going to bother with whatever Furion is going to come up with. 9th Age is not finished yet, Beta version is going to be released soon and I believe these guys have a better chance to create something good in the long term.